I'm new, not an expert. Here are reasons why, not in any particular order. 1. Draft beer tastes better to me. 2. Wife often works opposite shift and hates clink of bottles. I have 4 taps for variety isn't a big issue for me. 3) Parties - it is much easier to host a party with beer on tap than in bottles. Clean up is trash bags instead of 3 hours of doing dishes. It is also easier to take beer to a party than to haul bottles around. 4) Rapid packaging. I can fill a keg (or 2) and clean up the fermentor/s in 1/2 an hour or so. Sanitation is one container, not 50+. Maintenance has not been that big of an issue for. Cleaning the lines can be done while I'm cleaning 4 or 5 kegs at once. 15 minutes now and then to clean the lines is easy to fit in my schedule. I may spend a couple of hours cleaning kegs every couple of months but that feels more efficient to me than having to clean bottles every couple of days. To each their own. I still have some bottles around but not nearly as many as I used to have. The biggest advantage to me is that I can pour myself whatever volume I want. Kegging is twice as fast as bottling, if not more. If you find yourself spending hours cleaning lines you need to find a quicker process. I don't clean my lines after every batch, either, and don't think there is a need to. Regardless, it's easier to dial in the co2 on draft beer and less chance of infection. And I agree, often draft beer does taste better. Commercial bottled beer is often overcarbonated for my tastes. 1. Time. It is much easier kegging than bottling and takes less time. 2. Cleaning is easy. Homemade keg cleaner (bucket, pump, line and disconnects). Stick it on and let it rip. Also clean lines with gadget featured on AHA site. I find myself bottling more these days for exactly these reasons. I prefer kegging, however, as it's just easier to get it done. I can clean the kegs at my convenience and keep them sealed under pressure so they're ready to go. 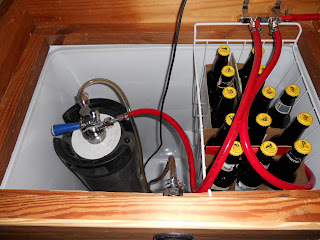 Filling a keg is simple and does not require the hands-on attention that bottling does, which is important for me as I have usually at least two children interrupting at any one time. Serving and clean-up are nice and easy, too. I find that bottles create a ton of clutter. I have empties everywhere. The bottle tree takes up space. Etc. 1/ Quick, accurate carbonation (which can be fine tuned, if need be). 3/ I think it tastes better. 4/ Party friendly, for cleanup. A kitchen full of empty bottles that suddenly need rinsed from a party is a PITA also. 5/ I can fill anything from a sample glass to a growler or stein. Man all that mess you do to your keg IMHO is wayyyyy overkill. I just kegged a batch last night and it took me all of 10 minutes. Took the keg with the few ounces of leftover beer in it to the sink, rinse, fill with a half gallon of water and some Sanitizer. Put the lid on, shake it up, hook up co2 and flow solution through your dispensing tube. Empty keg and fill with new beer. Done. I've done 100 batches like this and never had a problem. So to answer your question, my reason I keg is because its cheaper. I don't waste bottles, priming sugar, caps, time, and Sanitizer when I keg. It costs me between $28 and $35 to brew a 5 gallon batch of whatever. I can lager 8 kegs in my chest freezer. One reason. When I graduated to all grain, I made my own chiller out of 40' of 3/8 copper. That lead to carpal tunnel. Even with a bottle brush on an electric drill, cleaning bottles was sheer agony. My wonderful wife said,"Wouldn't kegging be easier?" This here is one reason I'd stick with kegging. Don't want to mess with bottling lagers, adding yeast at bottling, etc. But carbonation isn't much of an issue with bottling is you know what you're doing. Neither is sanitizing bottles if you clean them out properly after you pour a beer. I don't think kegging is cheaper. The upfront cost is way greater, you still have to pay to replace lines, moving parts once in a while, deal with possible CO2 leaks or even liquid post leaks. I'm not arguing that bottling is better, I just think it's simpler. Sure it's more work on bottling day, but that's it, it's a one time deal. Kegging requires ongoing maintenance, which isn't necessarily bad or inconvenient. Thanks for you input. I really enjoy kegging also, but enjoy the experience of opening a bottle of beer. I guess that's why I still do both. quicker to package, quicker to carbonate beers that benefit from freshness, less variability in carbonation, cool factor of having a 4 tap keggerator I built myself, variable pours (I like an 11 ounce glass). There is a certain satisfaction to operating a bottle capper, but that wears off after 6 bottles. I like to bottle my aging beers, however, and like to give bottles away.